Our seedlings from the first workshop sprouted nicely in the flats and were ready to transplant into 4 inch pots on the 26th as planned. There was a chance of rain, but it turned out to be great weather for the workshop after all. 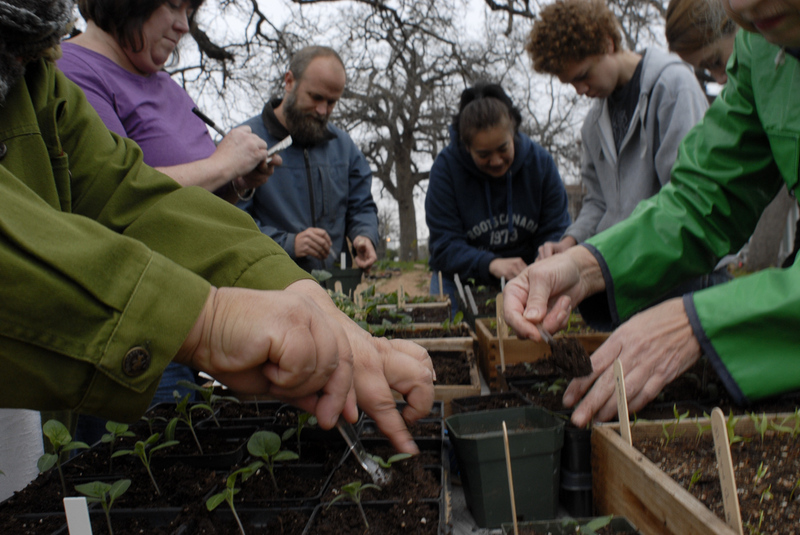 We had a good turn out of volunteers and ended up with about 400 tomatoes, eggplants, and peppers that will be ready for our spring dig-ins starting on March 23rd. I’ve posted a few photos below from the workshop and some of the plants thriving in their temporary home. 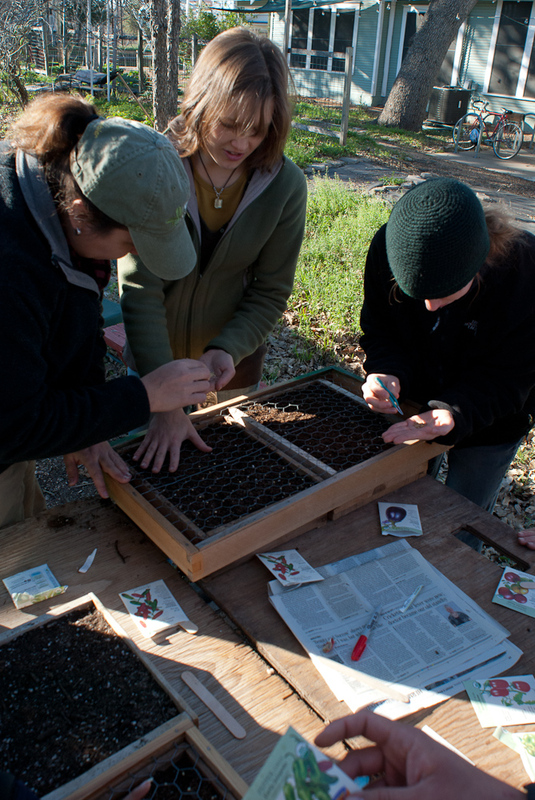 Join us and the plants for our dig-ins and for upcoming gardening workshops. You can get more information and register on our website. Our 2012 Fall Festival in October was once again, a huge success. Thanks to Boggy Creek Farm for hosting and for everyone that donated their time and energy to making it possible. We had over 20 of Austin’s best restaurants, 2 chef demonstrations, 4 bands, a silent auction and much more. If you missed this one, be sure to plan for 2013 – the date in October will be posted on our website as soon as it’s confirmed. To see photos from the event, click the picture below and then click the next image that displays. 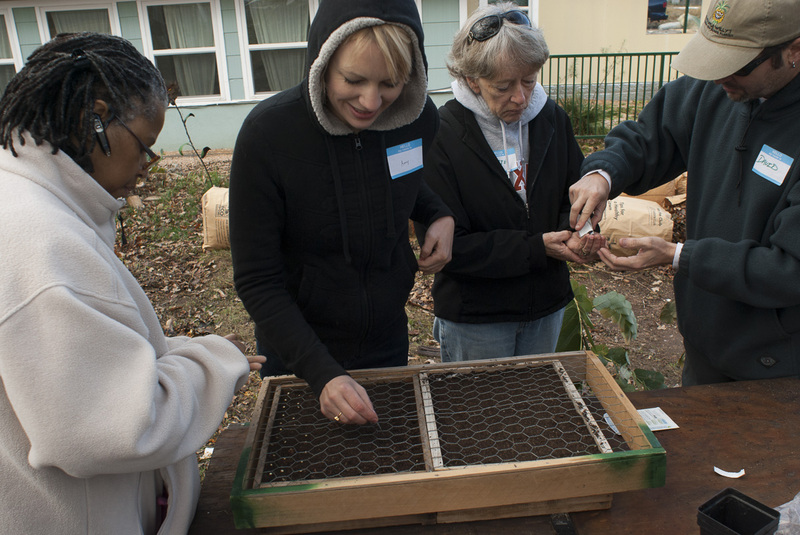 There’s still room to register for our Seeds to Start workshop this Saturday the 26th where we’ll move the transplants to individual 4 inch pots. 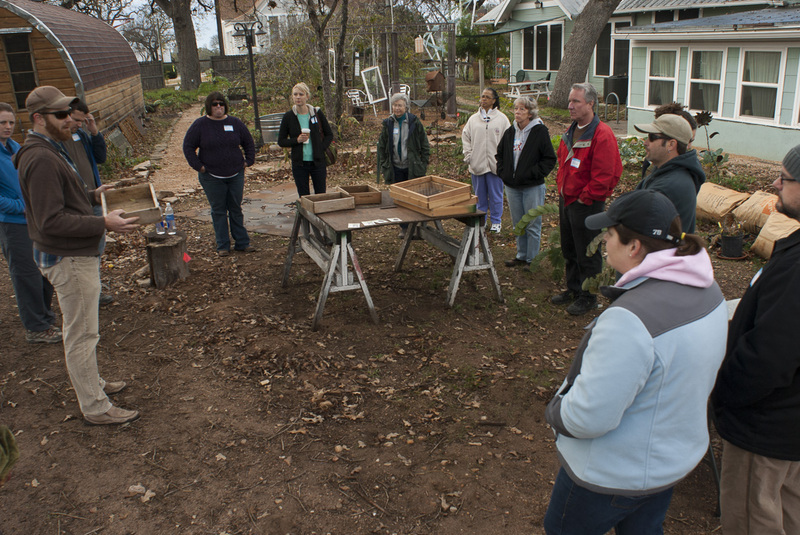 For dates of other upcoming events like our spring dig-ins and training workshops, please visit our website. 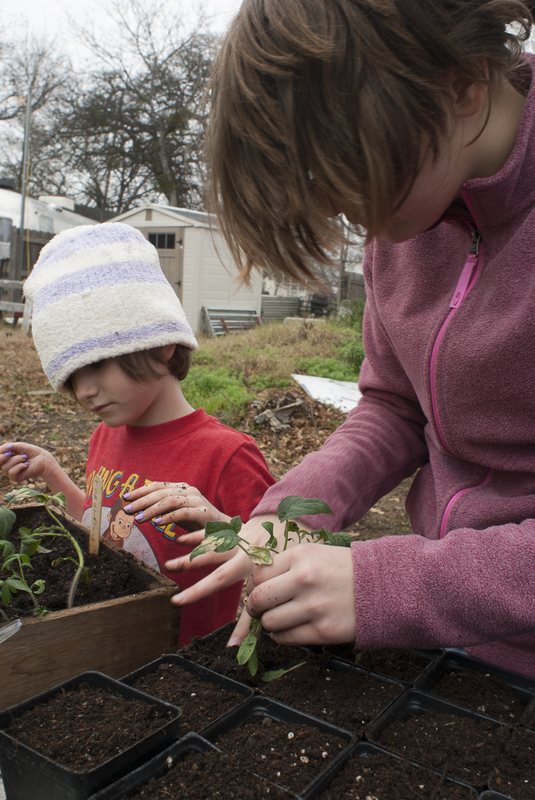 A lot has happened since my last post – we wrapped up our fall dig-ins in September, we had our annual Fall Festival in October, we held a gardening workshop in November, and completed part 1 of our Seeds to Start (STS) workshop a couple of weeks ago. I’d like to post a few notes and photos from the first STS workshop so folks can see the progress of the plants before the 2nd workshop in a week or so. Next week, I’ll go back in time and post some pictures from the wonderful Fall Festival we held at Boggy Creek Farm in October. 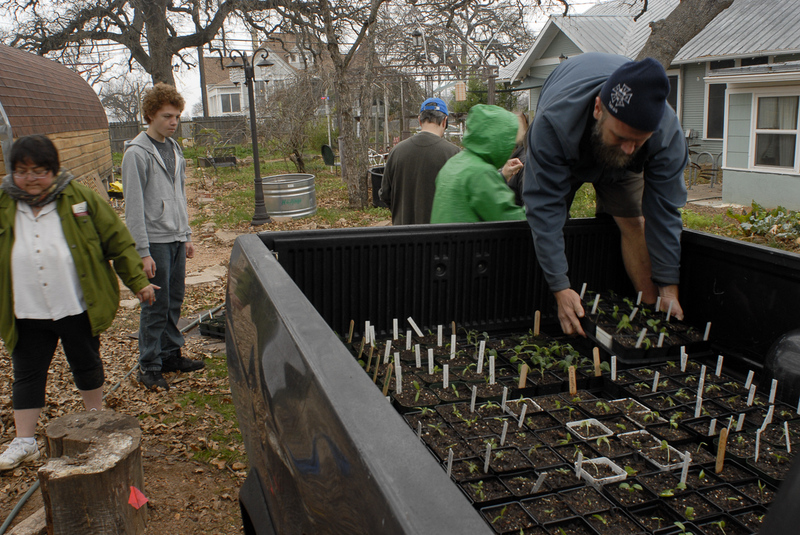 There was a great turnout for STS in spite of the cold morning – about 18 brave souls joined us to start seeds for our spring gardens. We started a couple of varieties of tomatoes including the yummy heirloom, Brandywine and some Sweet 100 cherries. We also started peppers and eggplant. We followed our usual process of starting the seeds in flats lined with newspaper using Vortex Germinator soil from The Natural Gardener. A couple of us divided the flats up and each brought 5 of them home to sprout. If all goes well, we’ll return them on the 26th for the second workshop to transplant to individual 4 inch pots. 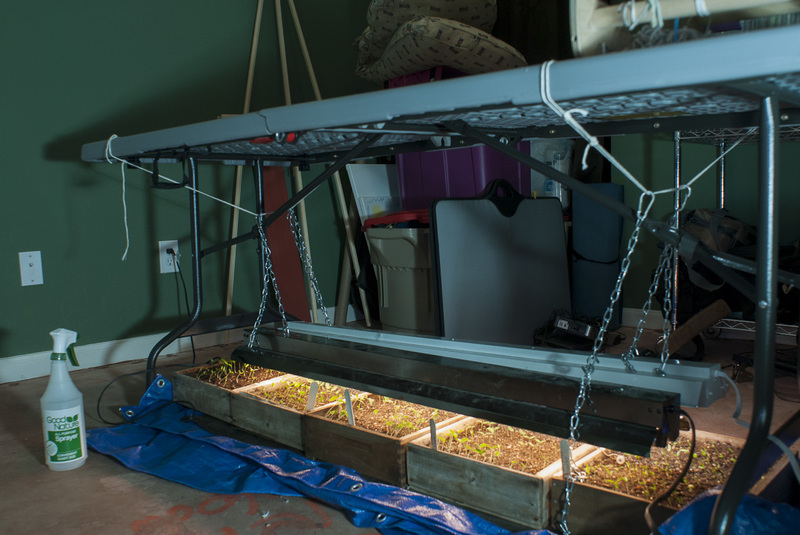 I have a few pictures below from the workshop and 1 of my setup at home with warming mats to keep the soil temp where these spring veggies need it – around 70 degrees. I use fluorescent lights with standard bulbs (not grow lights), but as I’ve described before, I use 1 cool and 1 warm bulb to provide a more complete spectrum. Now that they’ve sprouted I can take the flats outside on warm days to get the real thing. Even soil moisture is essential during germination so I keep a spray bottle close by. All of this is tucked away on a tarp under a table with the lights hanging from string. 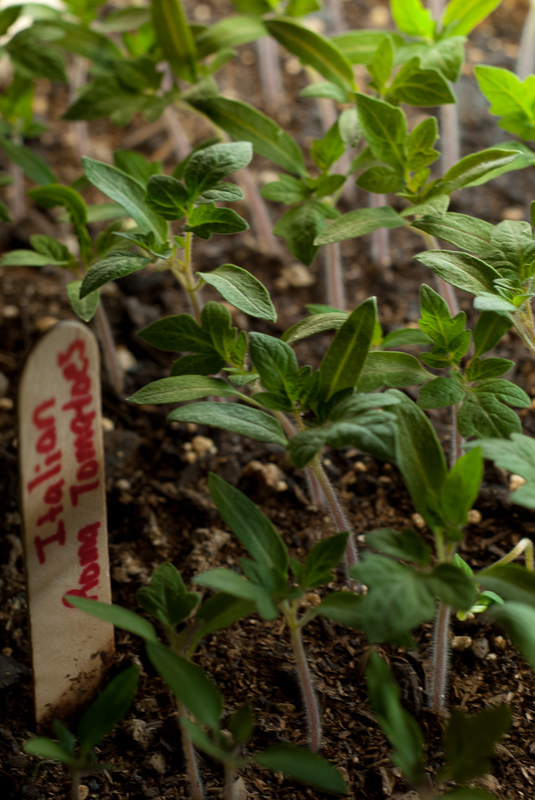 Keep in mind that this same process works well on a smaller scale for your home gardens. You can use a variety of containers if you don’t have flats including egg and milk cartons. You can also sow the seeds directly into 4 inch pots either by putting 3 or 4 seeds in each pot and keeping the strongest – this removes the need to transplant later. Alternatively, you can start 10 or 15 seeds in each pot and transplant them to individual pots once they sprout the 2nd set of leaves – usually in a few weeks. Keep the soil warm and evenly moist and keep the lights close to the pots once they sprout. This is a great way to always have plants ready to go in the ground when the weather is right. As I mentioned, I’ll post some pictures from our festival next week and otherwise, hope to see you at the 2nd STS workshop or our spring dig-ins. We’ll also have another gardening workshop coming up – visit our website for more information or to register for these events. Our fall dig-ins are off to a great start. Volunteer teams refurbished 5 gardens on Saturday, and in spite of the welcome rain, installed 1 new garden on Sunday. One of Saturday’s refurbs was Imagine Art, a wonderful organization that provides a studio for artists with disabilities. 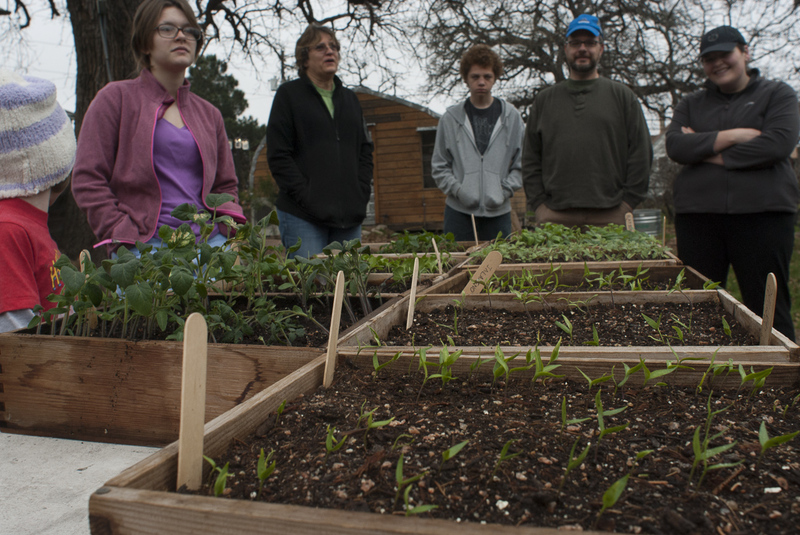 If you happened to see the summer issue of Edible Austin, I had an article on IA and working with them to install their garden last spring. Imagine Art has a large garden area that they want to increasingly use to provide veggies for the lunches they prepare daily and several dinners each week for their artists, volunteers, and friends. The GCP team enjoyed a meal on Saturday during the dig-in as Lydia, a volunteer and artist, prepared delicious migas tacos and Debbie, the founder of IA, made pancakes. We double dug 2 beds and discussed how they can build and maintain compost bins. On Sunday, I worked with a dedicated team that didn’t let a little (OK, a lot) of rain slow us down. We installed a new garden in a location that involved digging up a few deep-rooted volunteer trees and relocating a rose-bush and several canna lilies. We usually try to find an open area, but this was the spot in the yard with the most sun. By the time we finished, it was raining pretty hard, but we managed to relocate the previous occupants of the area, double dig the bed, plant fall veggies and seeds, and have a philosophic discussion about the meaning of life. I’ve included a few pictures from the weekend dig-ins below, but first I want to mention that we still have 2 dig-in weekends left for the fall – if you’re interested in sharing your gardening knowledge or learning to garden yourself, please sign up on our website. Also, our amazing Fall Festival is coming up on October 28th. It will be held as usual at Boggy Creek Farm and will have plenty of good food and drink, great music, and chef demonstrations. You can purchase tickets in advance on our website. I hope to see you and one of the upcoming events! It’s been a while since I posted but GCP hasn’t been sitting still. We installed 6 new gardens last spring and refurbished quite a few others. 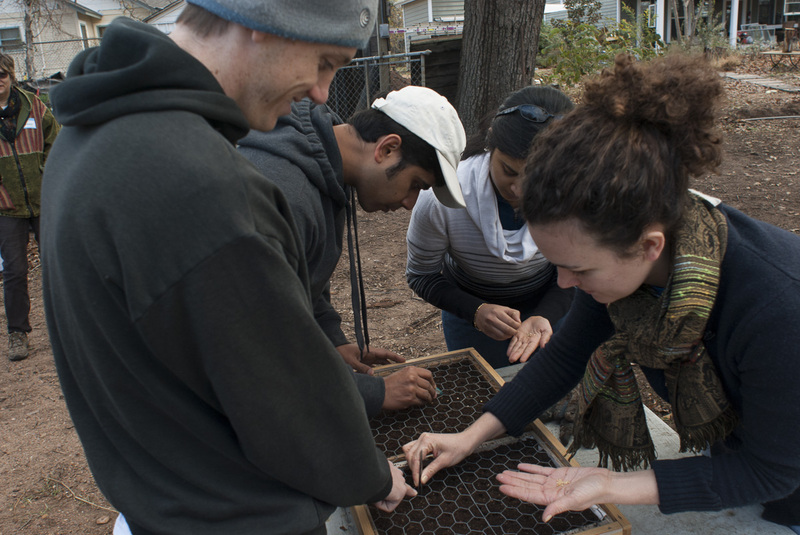 We’ve held dig-in leader trainings, Seeds to Start workshops, and had our first of hopefully many garden maintenance workshop. Fall is always busy for us with workshops, dig-ins, and getting ready for our annual festival in October. You can sign-up for dig-ins and workshops on our website as well as purchase tickets for the festival. If you haven’t been before, it’s a great family event held at Boggy Creek Farm with delicious food from Austin’s best restaurants, chef demonstrations, and live music. 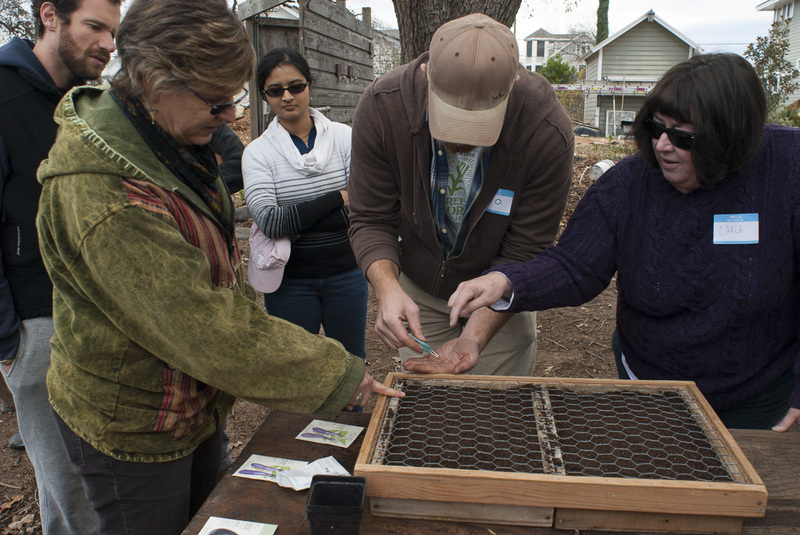 Here are a few pictures from the spring dig-ins and our recent fall STS workshop – I hope to see you soon! 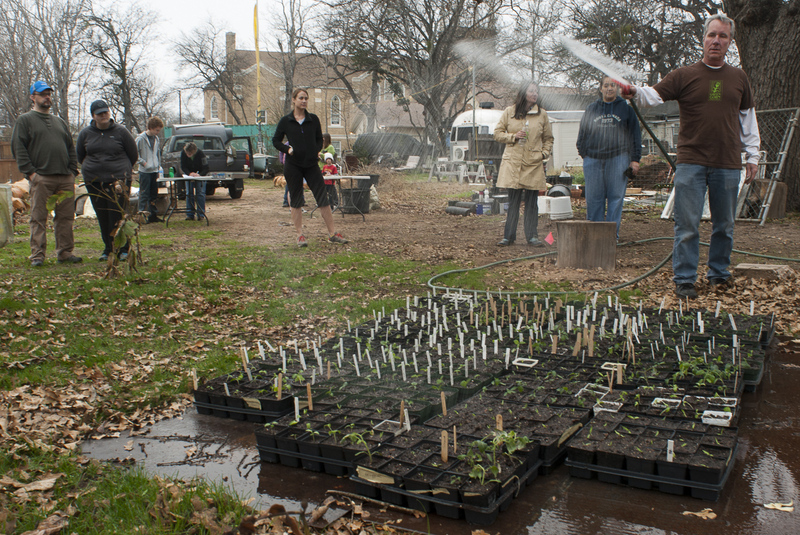 The threat of rain didn’t stop us from transplanting our starts on February 4th. It actually turned out to be a nice day, though a little chilly. We had a great crew and moved our starts from the flats to 4in pots. 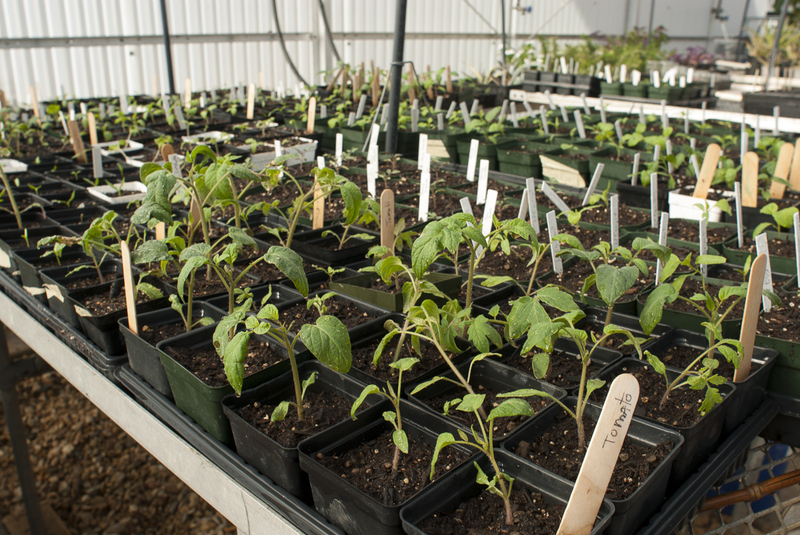 Thanks to Murchison Middle School for sharing some of their greenhouse space – our plants have a good home until dig-ins start on March 17th. The photos below are from the workshop and the greenhouse. The last one in the set was taken a week after the workshop – not much visible progress, but they look happy! 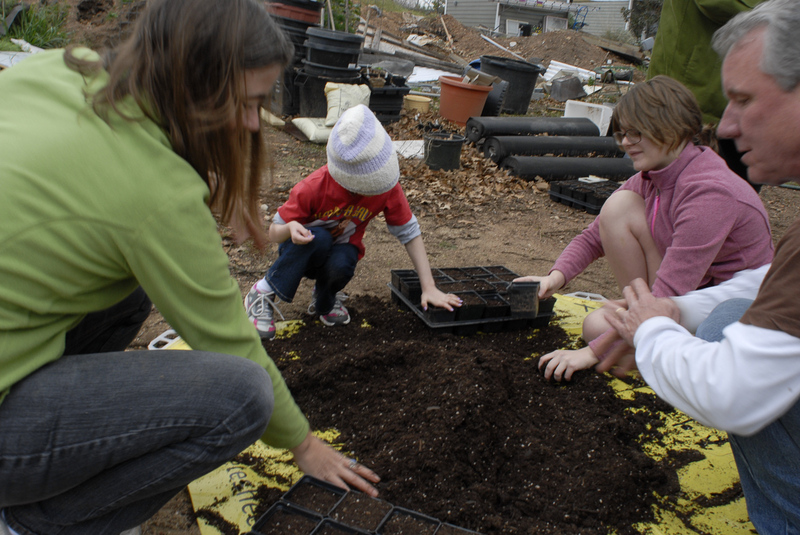 Remember that our dig-in leader training workshop is coming up March 10th and dig-ins start the next weekend and run for 3 weekends. You can get more information or sign-up for one of these events on our website. 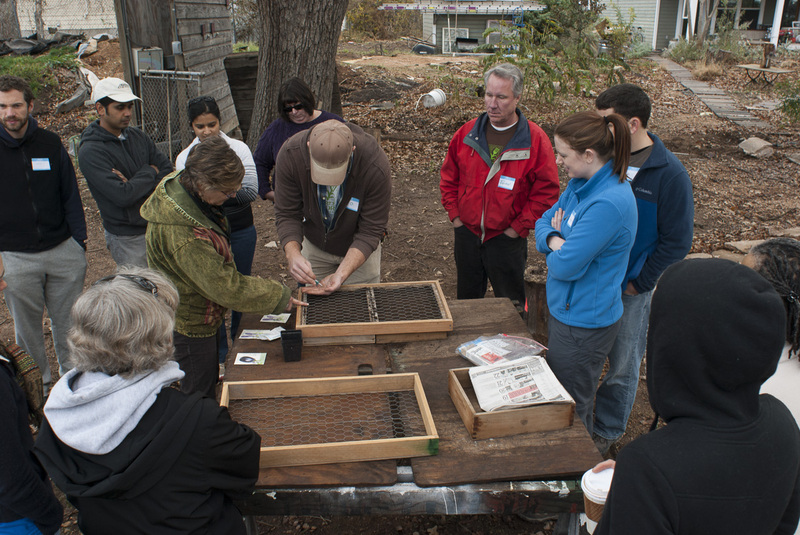 We had a beautiful day for the first half of our spring seed starting workshop on the 14th. Once again, thanks to everyone that came out to help! We planted 11 flats with tomatoes, eggplant, and peppers. They weren’t quite ready for the scheduled transplant day on the 28th but they’re looking good for this Saturday the 4th. Here are a couple of pictures from the workshop and a couple of the plants in their little home until they move to 4inch pots this weekend. I have them under fluorescent shop lights, each with 1 cool bulb and 1 warm bulb. That’s close to daylight and a bit less expensive than grow lights. 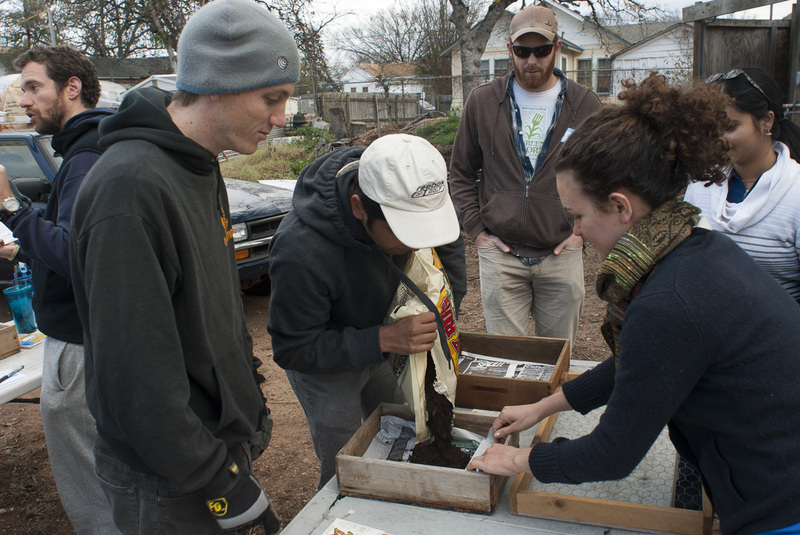 Our dig-in leader training is coming up on March 10th and spring dig-ins start on the 17th. Visit our web page to register and I hope to see you at one of these events.